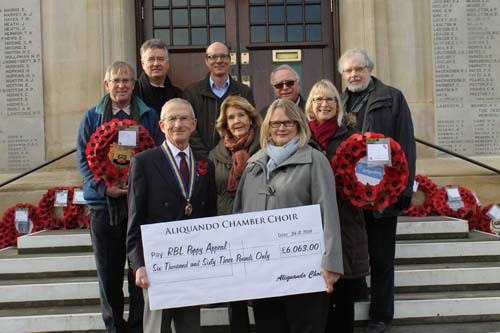 Aliquando’s concert on 8 November held in St Mary’s Church Henley and in aid of the Royal British Legion Poppy Appeal was deemed the most successful yet – raising in excess of £6000! A full church, RBL branch banners on display, the knowledge that distinguished guests were present, including Wilfred Owen’s nephew Peter Owen, and Air Chief Marshal Sir John Shakespeare Allison KCB, CBE, currently Gentleman Usher to the Sword of State, engendered a unique atmosphere which was felt by the choir and orchestra and most keenly by the audience. The Aliquando Choir were privileged to work with composer & Conductor Patrick Hawes, who took a commission from Aliquando to set a little known Wilfred Owen poem for choir, soprano soloist and string orchestra and who agreed to conduct the entire concert which included the world premiere of ‘I Know the Music’ and also his own setting of Christina Rossetti’s ‘Remember’. The Cherubini Requiem in C Minor completed the programme. Peter Owen’s words to Patrick Hawes said it all “Wilfred would have loved your music and setting of his poem”! 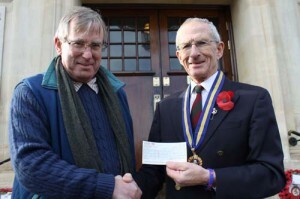 Henley Air Cadets – We Need Your Support Do You Have Time to Save a Life?